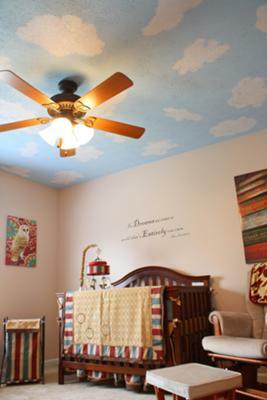 Our baby nursery was inspired by the entire epic series of Harry Potter novels by J.K. Rowling. My husband and I are both HUGE fans ... but it was my (mom) idea to turn our passion into a truly one-of-a-kind living space for baby! Ceiling: Valspar matte in "surfer waves"
Clouds: Valspar semigloss "snowcap white"
We painted our ceiling with clouds that mimic the ceiling in the Great Hall at Hogwarts ... we simply rolled on the blue paint with a foam roller ... and then used a NATURAL sea sponge to paint the clouds in white by hand ... making each of them unique in shape and size. "Just One You" Carter's Heirloom crib from Target. We used a dresser and wardrobe that we already owned ... and purchased the "Just One You" Carter's Heirloom crib from Target as well as a Shermag Glider Rocker from amazon.com. Our bedding set is "Aidan" by Cocalo Couture and we purchased it from amazon.com. Our window treatments are my absolute favorite ... not so much the valance ... but the curtain rod constructed from a handmade broom (custom made by a broom crafter). designs from NothinbutVinyl on etsy.com ... all inspired by Albus Dumbledore's words in Rowling's novels. The antique trunk is an authentic 1872 travel trunk purchased from an antique restoration expert. The magic wands and Hogwarts scarf were purchased from gift shops at Universal Studios "Wizarding World of Harry Potter." The various smaller details -- photo frames, wall hooks, etc are from a variety of craft stores such as Michaels and Hobby Lobby. One canvas wall print (owl) is from Pier One. The large canvas wall art of the stacked Potter books is from a photograph taken by me (mom) and put onto canvas through walmart.com. Our baby goodies are mostly stored in the closet and in drawers ... with the exception of the compartmentalized basket on the changing table for creams and lotions. 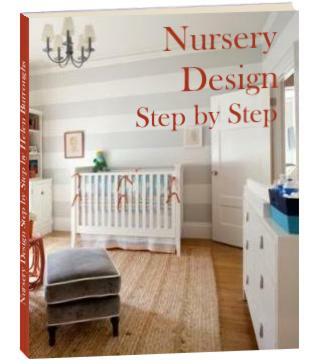 Working sporadically, the nursery took us 13 weeks to complete. It was incredibly FUN! 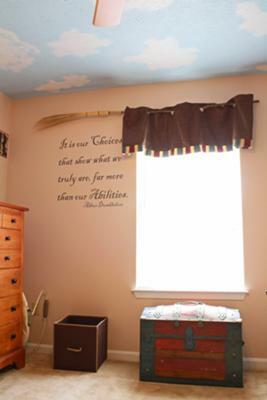 I thoroughly enjoyed scavenging for the most unique and authentic Harry Potter decor I could find ... while keeping the nursery "baby friendly" in overall appearance. My favorite part of designing the nursery was finding truly one-of-a-kind items like our handcrafted broom curtain rod, our circa 1872 trunk, and a miniature cauldron. My husband and I fashioned the entire nursery ourselves. That he will be the only baby with a bona fide Hogwarts-bound nursery!